TORANA A9X. 1977 30th ANNIVERSARY EDITION The story of the A9X development, awesome Bathurst race photos, driver interviews, rare GM-H historical photos, V.I.N. decoding, feature A9Xs and more! TORANA A9X. BATHURST 1979 30th ANNIVERSARY EDITION The greatest Bathurst win of all! Full Bathurst Race Report, driver interviews and awesome photos. Brock’s actual racecar. Rare GM-H historical photos, feature A9Xs and more! TORANA XU-1. 1972 40th ANNIVERSARY EDITION Brock’s first Bathurst win! The full story of how he did it plus awesome Bathurst '72 race pics, GM-H archive photos, plus loads of feature XU-1s and more! MONARO THE LEGEND. HK GTS 40th ANNIVERSARY EDITION Celebrates the mighty HK GTS 327 with secret GM-H design drawings, V.I.N. 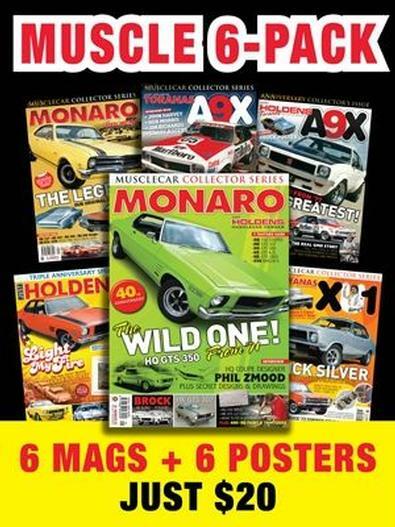 decoding, 1968 Bathurst, 8 great feature Monaros and more! MONARO HQ GTS 350 COUPE. 40th ANNIVERSARY SPECIAL EDITION The inside story of the HQ coupe's development, secret GM-H designs. Plus; 7 awesome feature Monaros, Resto & Tech, V.I.N. decoding, every HQ paint and trim codes, and more! HQ SS 40th ANNIVERSARY EDITION 40 Years of the HQ SS - the story how Holden developed its first four-door sports sedan plus production blueprints, GM-H archive photos. Plus 50th anniversary of the EJ Holden and more! PLUS 6 FREE POSTERS! Monaros, Toranas, Brock and more! Be the first person to tell us what you think about Holden Muscle Car and you'll save $5 on your next purchase!